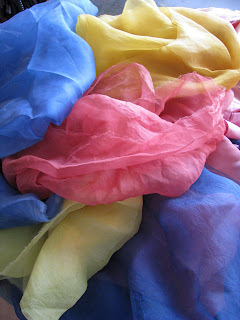 I think I'll make some attachments with these silk organza fabrics, they have all been dyed with natural dyes. Somewhere in this mess I have some silk ribbons, yarns, etc. that I dyed at the same time that'll also look good on the surface of my latest baby. I also have some raw handspun muga silk yarn that'll do for branch defintion, can't seem to find my brownish raffia I had on hand - it was a weird coffee color that would work really well for branch material.